The Social Welfare State Front, a coalition of the Social Democratic Party, Taiwan Radical Wings and the Green Party Taiwan, holds a news conference in Taipei yesterday announcing its aim to win seats in Taipei, Taoyuan, Hsinchu, Tainan and Kaohsiung in the Nov. 24 local elections. 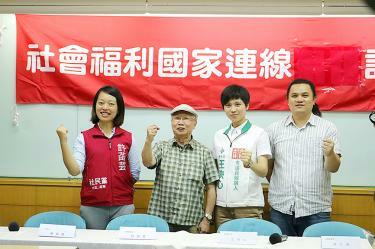 The Social Welfare State Front, a coalition of the Social Democratic Party (SDP), Taiwan Radical Wings and the Green Party Taiwan, yesterday said it aims to win at least three councilor seats each in Taipei, Taoyuan, Hsinchu, Tainan and Kaohsiung in the Nov. 24 elections, and to establish united party caucuses in the cities. The three parties on June 19 founded the front with mediation from former Democratic Progressive Party legislator Chen Zau-nan (陳昭南) to promote their shared platform policies, which include improving public housing, childcare and transportation, and establishing subsidies for start-ups. The front has candidates in 24 constituencies, Chen said, adding that while the final candidate lists for 20 constituencies have already been determined, those for the remaining four are still being discussed. The front is to field one candidate in every constituency, he said. “If there is more than one candidate, and if no consensus can be reached on who should run in the area, then a primary election would be held in the constituency for local residents to vote for their preferred candidate, but there is also the option of having multiple candidates in one constituency,” Chen said. The SDP has candidates in five constituencies in Taipei and hopes to have at least three elected in November, said SDP member Hsu Han-yun (許菡芸), who is running for a seat on the Taipei City Council. The front’s platform would benefit not only Taipei, but also other cities and counties, said Ong Iong-sim (王映心) of the Taiwan Radical Wings, who is also competing for a seat in the Taipei City Council. “In addition to improving the economy, we should also ensure that wealth is justly distributed. For example, did our salaries increase when GDP growth increased? Instead of being paid more, many were paid less as the wealth gap continues to widen,” Ong said. The Green Party has councilor candidates in Taoyuan, Jhongli and Hsinchu, and is to nominate more in Hsinchu, party secretary-general Chang Chih-wei (張志偉) said. The party in 2015 formed the Green-SDP Alliance and hopes to do so again to defeat the New Power Party (NPP), Chang said. “The NPP has refused to communicate, discuss or negotiate with us. Considering how tough the environment is for minor parties, the NPP, as the most influential minor party, should be more responsible, but if they are unwilling, the Green Party will take up that role,” he said. The SDP is still considering whether to form an alliance with the Green Party, Hsu said, adding that it also hopes that the NPP would discuss the possibility of collaborating with other minor parties. The front welcomes any young people who support their platform to join, with the exception of those in the Chinese Nationalist Party (KMT), New Party, People First Party and Chinese Unity Promotion Party, Chen said, adding that he hopes to see more young people with vision replace incompetent politicians from major parties.